I’ve seen these sandals on several sites..they are being touted as the next Crocs…they are called Dopie sandals and they are the epitome of minimalist. 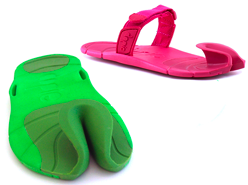 “DOPIE is the result of our search for a sandal in a simpler and pure form: a single shape sole to protect the foot that folds up between the toes to provide control. The combination EVA and rubber construction provides the perfect balance of lightness, comfort and flexibility.” Their site documents the two year design process. Apparently, you want to wear them without the optional velcro strap, but may need to use the strap until you become more accustomed to wearing them. wow, those are funky huh! I wonder if they would actually stay on…! ?